Proton and hydrogen transfers can be catalyzed by many things. Da Silva shows that carboxylic acids can catalyze the hydrogen shift that converts an enol into a carbonyl species.1 The specific example is the ethenol to acetaldehyde tautomerization. This reaction has a barrier of 56.6 kcal mol-1 (computed using the composite method G3SX). 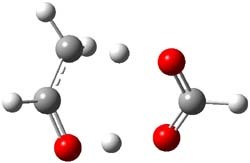 With formic acid as the catalyst, the reactant is the hydrogen-bonded complex of ethanol with formic acid and the product is the complex of acetaldehyde with formic acid. The transition state is shown in Figure 1. The barrier is only 5.6 kcal mol-1, a significant reduction. da Silva discusses how carboxylic acids might be catalyzing the enol-keto tautomerization in the troposphere and also in combustion reactions. Figure 1. B3LYP/6-31G(2df,p) optimized TS of the formic acid catalyzed enol-keto tautomerization of acetaldehyde. Bader has been advocating for his topological electron density method (also called AIM for “atoms in molecules”) as the answer to most fundamental chemical issues for a couple of decades now. He summarizes his position regarding molecular structure in a recent paper.1 Here he argues that physics (meaning quantum mechanics) provides a way to uniquely and non-arbitrarily define molecular structure. The atom is defined by the volume enclosed by zero-flux surfaces around a nucleus. The bond path indicates which atoms bind together. He is careful to indicate that the chemical bond, used in a sort of intuitive way by most chemists, is ill-defined, beyond or outside of physics. His “bond” (or “binding”) is simply the bond path – indicating a pair of interacting atoms. Bader really wants the union of the bond paths to correspond with the general notion of a bonded molecular structure. He suggests that for all cases, the chemical bonds in a molecule are always observed as bond paths within the electron density. This may be true so far – but certainly we have not examined (computationally nor experimentally) the electron density of all compounds! Equally bothersome is that bond paths occur between atoms for which most chemists would consider to be non-bonded – like between the ortho hydrogens of biphenyl or between hydrogens across the bay region of phenanthrene (see this post). He argues that the barrier for biphenyl rotation arises from the stretching of the C-C bond when the rings become co-planar, but why does this bond stretch in the first place? While Bader is certainly allowed to call the bond path a “bond”; the question remains whether this definition offers improvements or advantages concerning how we think about and understand molecules, their properties and reactions. To me, this remains an open question.